Maximize resources and space while accommodating seating for large groups with a steel shelter picnic table. These popular 10' and 12' rectangular steel diamond pattern shelter tables are modern, durable and accessible. Expanded metal table and bench seat with ultra-modern thermoplastic coated finish. The all steel, open diamond pattern offers a structurally sound surfaces great for outdoor high volume use. MIG welded, the 2-3/8"O.D. 12-gauge steel tube frame, 1"O.D. steel braces support and reinforce the table's durability and performance. User friendly walk through frame allows for comfortable maneuvering in, out and around these shelter tables. Wheelchair and Mobility Device access rectangular outdoor tables conform to current ADA specifications/requirements. 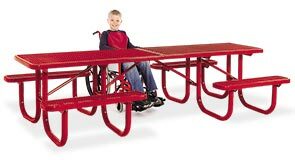 Promote enjoyment and inclusion with a three frame or four frame universal access models. The three frame style features dual sided overhangs that provides perfect access for two wheelchairs, while the four frame table, is capable of providing access for four wheelchairs. Separated bench seat configuration allows for two center seating options plus dual sided overhangs. The galvanized and powder-coated steel frame and components ensures maximum resistance against corrosion and harsh environmental conditions.